Insights from LBM dealers who’ve grown their sales with a showroom refresh. Q: Why did your team decide to renovate your existing showroom? 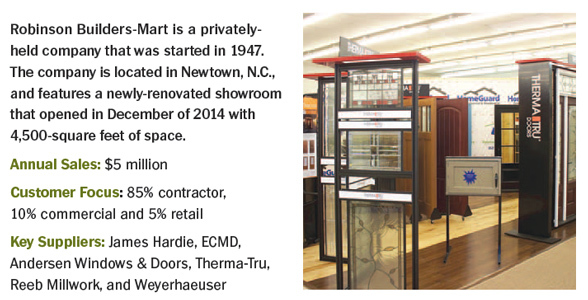 A: Our previous showroom and product displays were outdated. We needed a more customer-friendly environment for our contractors to bring in or send their customers to shop. Q: What type of assistance did you get from your vendors? A: Our suppliers were an excellent resource. They provided displays, layout suggestions and even labor to help organize the showroom. For example, Therma-Tru helped us design the major millwork display area and also provided physical labor by putting their displays together on site. Q: What features have you added to specifically draw builders and remodelers to your showroom? on the professional building industry customers for our area. Q: How do you encourage builders and remodelers to use your showroom? A: We added a new conference room for our builder and remodeler customers to bring in their homeowner customers. The new functional displays really allow this audience to demonstrate products to their customers while in our showroom. We’re also using this space for contractor, architect and sales training.